Dennis McNett , a photo by LoisInWonderland on Flickr. Among the nine skateboard-based artists in the show opening at Artspace Shreveport on Fri, Jan 31, 5 to 9 pm, ($10) is Brooklyn-based graphic monster Dennis McNett. McNett's work looks like C. Mark Burt crossed with Micah Harold. He is a contemporary, vulpine Hieronymous Beast. 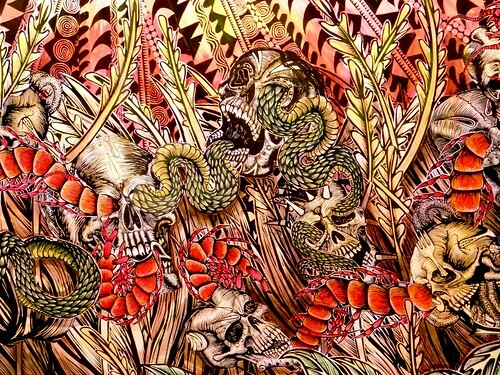 "Teeth-gnashing wolves, writhing serpents and penetrating owls stare and glare from aggressive masks as well as linocut and woodcut prints and carvings," wrote Gwynn Vitello for Juxtapoz.com of the recent McNett opening at Known Gallery, Los Angeles. At the Print Center Gallery Store McNett is celebrated thusly: "His graphic aesthetic and love for narrative work has been translated in many ways from larger than life Viking ship performances/parades (Manhattan, Philadelphia, Kansas City, St. Louis), to resurrecting Nordic giants on West Broadway in Manhattan, Dragon slayings in Oklahoma, masks, installations, performance, sculptures, unique hand-carved wood carvings, traditional relief prints, and graphics." More: "Participating in both the ﬁne art and design worlds, McNett has created series’ for Anti-Hero skateboards, designed shoes for Vans, has had his work ﬁll the windows of Barneys, New York, and participate in the Deitch Artparade. His work has been featured in The New York Times, Juxtapoz, Thrasher and Complex Magazine." Destinitively pursue the brodfallianesque imagery of the energy-spewing McNett of Wolfbat Studio.